What are the different parts of PAM? How do scientists use PAM? What does the data from PAM look like? ﻿PAM is an instrument called a fluorometer here at the Sotka Lab PAM stands for pulse amplitude modulation. PAM is used to measure a plant's activity, particularly chlorophyll fluorescence. What is chlorophyll fluorescence you ask? Let's take a look inside the leaves of a plant to the inside of its cells! We know that cells are the smallest unit of life. Plant leaf cells have unique components called chloroplasts. Chloroplasts are filled with a green material called chlorophyll. Have you ever wondered why plants are green? Chlorophyll gives plant leaves their green coloring and allows them to absorb sunlight. When chlorophyll absorbs light energy, it passes that energy on to different parts of the plant. If there is no where for the light to go, it will be released back as light again. This is called fluorescence. As PAM measures chlorophyll fluorescence, we can get an idea of how stressed plants are, which can help determine how much photosynthesis is occurring in the plant. Scientists at the Sotka Lab, including Nicole, use PAM to continue understanding the plant alga they are researching. PAM has a probe that is held over plant samples. The probe is attached to a clip that holds it in place. This is important to make sure the probe is an equal distance and angle away from the plant samples. 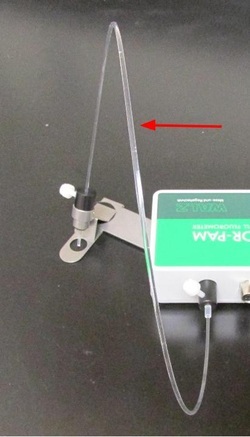 A fiber optic cord connects the probe to the machine base. A USB cord connects PAM to a computer. The computer is where the data is shown. Scientists using PAM should not be afraid of the dark! Why is that you ask? At the Sotka Lab, measurements taken with this instrument are done in a dark room! Don’t worry, the scientists use headlamps to see! All algal samples are brought into a dark room to ensure that no photosynthetic cell parts of the plant absorb light. Once the plants are dark adapted, the plant is put under the probe. An initial measurement is taken to see the plant's lowest fluorescence level. PAM flashing high intensity light. 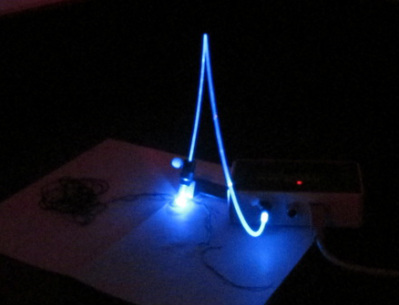 Afterwards, the fiber optic cord flashes a bright high intensity light to excite the plant, so it releases light energy back as fluorescence. The probe measures the plant's initial activity. The probe measures the plant's activity after the flash of light. PAM gives us information in the form of a graphs, as well as numerical data. To learn more about graphing click here! The numerical data from PAM is shown to the right. 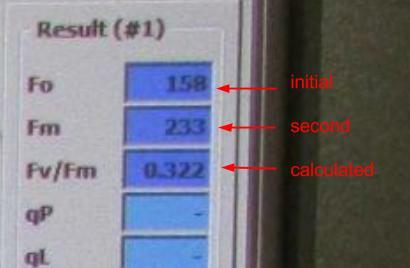 The two measurements are recorded, as well as a calculation that the computer does for us based off of the two measurement values. The calculations help scientists determine how much a plant is able to photosynthesize. High values tell us that there is more potential for photosynthesis to happen, while lower values will indicate that the plant is more stressed, less photosynthesis is occurring and therefore the plant is putting more energy into other processes. Measurements and calculations. Located on top right corner of the data screen shown previously.